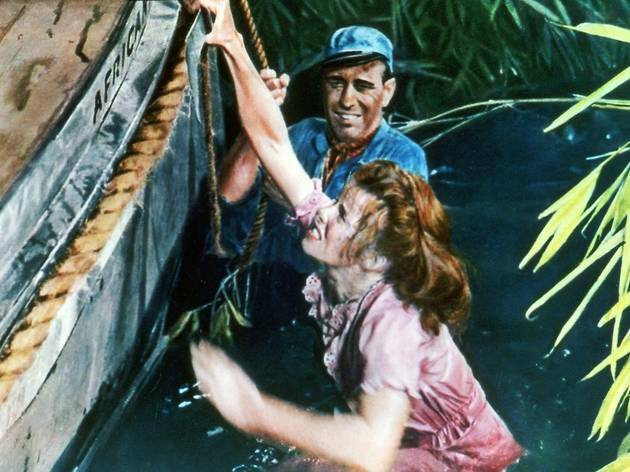 Digitally restored in time for its Sixtieth anniversary, this sprightly Bogart-Hepburn romantic adventure – detailing the steamboat ride undertaken by a boozy old Africa hand and a feisty Methodist missionary to torpedo a German gunboat at the outbreak of WWI – is back to the Technicolor dream it was in 1951. Clint Eastwood’s 1990 ‘White Hunter, Black Heart’ outlined the trials of director John Huston realising CS Forester’s 1930s novel on location; that Huston was more occupied with hunting is evident in some under-directed sequences. But, as basically a two-hander, it’s an actor’s film; and although Bogey seems embarrassed having to personify the redemptive forces of courage, love and duty, he’s well worth his Oscar; while Hepburn can play mettlesome and arousable in her sleep. Credit should also go to the crew; to Jack Cardiff for his frond-filled imagery and maestro sound recordist John Mitchell for his atmospheric soundscape.